As the rain mixed with snow, it sounded like pellets hitting the window of the DeHavilland Beaver. The wind was blowing pretty hard and the clouds were laying low on the mountains. Visibility was fine to fly, but impossible to see tracks in the snow and looking for a campsite was a challenge. We had already waited several hours for the pass to clear, before we headed out to our new nylon homestead. We picked a spot close to freshwater and in a depression which would provide good cover, regardless of the wind direction. This required us to haul twelve days of gear uphill about 100 vertical feet. Setting up our tent and getting our gear situated required some effort. 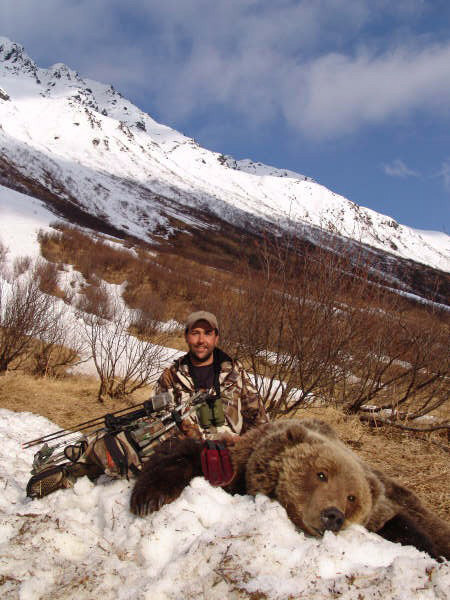 When hunting Kodiak Island, the bears are not the biggest concern, as mother nature herself can bare some serious teeth and she is certainly the most important force to respect and fear. We took it easy the first afternoon, sampled our first dehydrated meal and crawled into the sacks early. On day two (our first day of hunting) the weather had not improved much since our arrival. Visibility was poor, but we could see enough to get around and explore our hunting area. As with most drawing tags, our area was specifically outlined. We needed to figure out where to spend our limited time, with the best opportunity for success. Kodiak is a comprised of steep mountains, which rise straight out of the ocean. 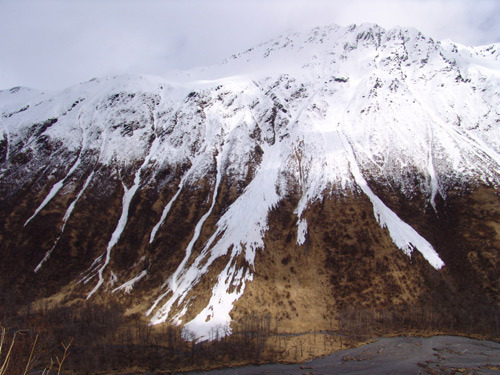 The various bays which make up the coastline are surrounded by snow-capped peaks, full of game. We saw red fox, blacktail deer, bison and mountain goats every day. In fact the majority of the bears we found were all coming out of their dens - well above the goats. We sat atop a rocky ledge, glassing the valley for several hours, in search of movement, tracks or any kind of bear sign. We were unsure in the early stages if we would find bears on the beach, foraging on the hillsides or just emerging from the dens. It was one of the latest springs in decades and so the activity was somewhat unpredictable. Late in the afternoon, the temperature began to drop and the rain and sleet transformed into big fluffy flakes of snow. We could see a huge storm on its way as we beat hoof back to camp. 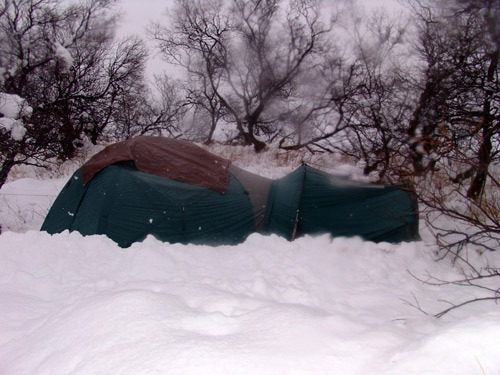 By the time we got settled inside, a white blanket was already forming on the ground. The flakes were loud on the rain fly of our tent. It was cold but we knew that the new snow would wipe the slate clean. Any spore we found thereafter would be fresh. Around midnight, I woke to find the sound of the snow had stopped. It was not nearly as cold and I was anxious for the morning. About an hour later, I heard what sounded like a branch snapping. My eyes popped open and I said to my cameraman, Chris Martin, "I hope that was a tree branch." The words barely left my lips before the entire tent collapsed on us. It was quiet and warm because the snow had piled up two feet and created an igloo. We pushed the snow off from the inside as best we could and decided to go back to sleep until first light, when we could assess the damage. It took us about three hours to clear the snow, using a titanium cook set for a snow shovel. We had to use sticks to brace the tent poles which broke and fixed the rain fly with patches from our dry sacks. It wasn't pretty, but it was secure and dry. Once the work was over, we were able to take time and look around at our completely white surroundings. The snow had diminished and the clouds were rising by the hour. 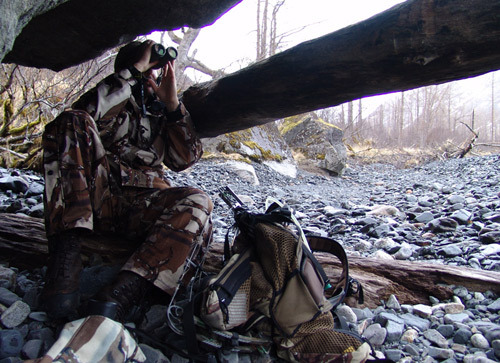 This was encouraging as visibility is key on any alpine-style hunt. One should plan to spend as much time with eyes in glass, as boots covering ground. So, we hiked in knee deep snow, back up to our lookout. Chris spotted the first two bears. One was near the beach and the other on the very top of the mountain. A third bear emerged late in the afternoon near the top and he was a true monster. His belly dragged in the snow and his movements were slow and awkward. This big boy was fresh out of the den for sure. The giant disappeared over the ridgeline, but the first bear we glassed, began to come down the mountain. He was quite a ways up the valley and while we contemplated heading in his direction, we saw an outfitter with his clients working the river floor. They did not see the bear, but they were walking right to him. A small hill keep the bear and hunters from seeing each other and we watched the events until they ended in with an echoing boom, followed by two more quick shots about five seconds later. Events could not have been better for us as we now apparently had the area to ourselves and we knew of at least one bigger bear. The future looked bright as we packed it in on day two. After a quick Mountain House chicken teriyaki and a cup of tea, the headlamps were clicked off. we changed clothes to keep up with the temperature and climate changes. We tried a few stalks on big bears and passed on a few smaller ones. A rifle hunter could have been done in three to four days. However, with close calls at distances between 127 and 250 yards, my bow was no better than a slingshot. In total we saw eighteen different brown bears. It was not until day ten that good bear with a good opportunity presented itself. We had been climbing the cliffs and working bears in the snow, sometimes waist deep. This bear was low, in the grass and the wind was pretty steady down the valley. We spotted him about two miles away and worked for several hours into range. The biggest challenge was maintaining a visual on the prey. Bears are like phantoms, disappearing from sight literally in the blink of an eye. We lost him a couple of times, but patiently glassed until finding a leg or other furry part in among the alder bushes. The brownie was above us on the hillside as we carefully worked beside him in the creek bottom. The breeze kept us from heading him off. So we continued parallel and hoped for cover. We wanted to close the distance with a crosswind. The bear's range was consistently between 127 and 145 yards. He was right there, yet so far away still. I practice year round and I shoot paper plates at long ranges, with my Alpine Silverado. However, a still target and dangerous game are not the same thing. I wanted an absolute clean kill and that meant we needed to be within 50 yards. It was nearly evening and light was fading when the bruin ran down an avalanche chute and skidded to a stop at the base of the hill. He stood looking around for a few seconds, before disappearing from sight. We jogged along the dry rocks and sand, using the sound of the creek for cover. The wind was finally in our face as we reached the snow slide. We searched and scanned, but there was nothing to see. After all that time, he was gone in a flash. He teased us for hours and then vanished back into the brush. I stepped onto the crest of the snow, initially frustrated, confused and distraught. "There he is," I whispered rather loudly, pointing to the bear at less than seventy yards. The snow rolled like a hill and this brown was so close, I couldn't see his back until were practically standing on him. We seemed naked on the pure white stage. However, from the bears point of view, we were completely concealed in Predator Deception camouflage, with a dead-forested backdrop. It was still a nerving time as I nocked an arrow and cautiously picked up my rangefinder. He was foraging on grass and working back towards us. When the bear reached 55 yards, I clipped on my release. He turned slightly and I nodded to Chris who confirmed he was "rolling tape" and ready. As I drew back, a steep quartering away shot was presented. My arrow slipped into hide, just in front of the hind leg and disappeared. He jumped and looked around at us. Then he jogged a few strides and slowed to a walk, looking around. At about a hundred yards, he stopped and dropped on his stomach, as if laying down. He never knew what hit him. I often say that there is not a "best hunt ever" or a "hunt of a lifetime," as each hunt is so different and special. 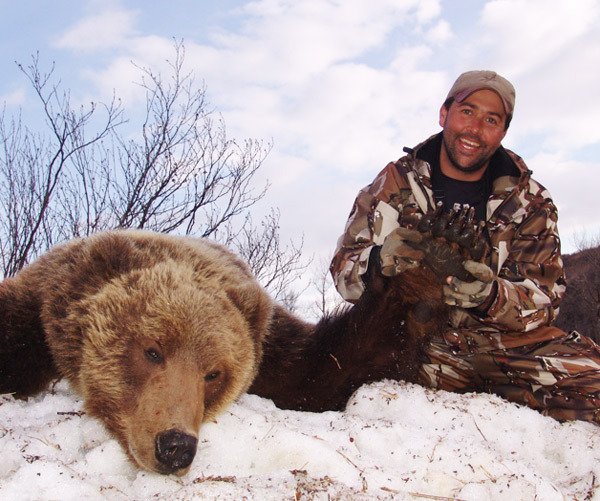 I must admit however, that the rush I got when that huge brown bear came to rest was the greatest of my hunting career. It's hard to describe the personal reward I received after nine days of hunting with such intense physical and mental strain. For those who have been on such a hunt, you know how it feels. This hunt was also a true testament to the outdoor products I've come to use and more importantly trust. Little things like a release freezing up or a blade coming off a broadhead can turn the hunter into the prey, in a millisecond. Bowhunting: Alpine Silverado 70 lbs, Gold Tip Pro Hunter 7595 ( total arrow 400 grains), Tru-fire Hurricane Release, Gateway 4" Fletches. 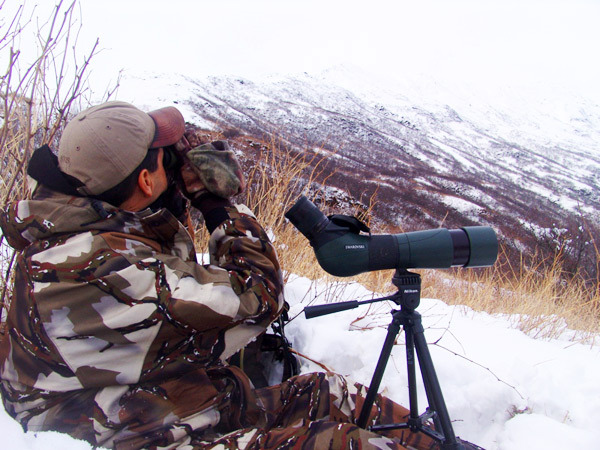 In Alaska and British Columbia nonresidents must use a guide to hunt brown bear. There are many great operators who can assist in creating an exciting and rewarding experience. 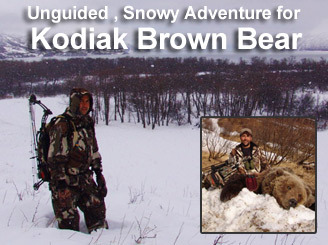 I highly recommend Brown Bear hunting to those that truly love hard-core adventure. Outdoor Writer and Professional Bowhunter, Host of Art of Deception TV, known for showing more wildlife footage than other outdoor program on television. Former resident of Alaska, now residing in Colorado, operating Legacy Sportsmen; an International Booking Agency and Hunting Club (www.legacysportsmen.com & www.legacyalpinemeadows.com). Harvested 35 species of big game worldwide, with bow and arrow and recently began dedicated pursuit of North America's Super Slam. Butterwick has volunteered in the industry on such projects as "Red, White and Blue Outdoors" and worked closely with the IBEP in San Antonio, Texas, with a focus on ethical bowhunting and survival skills, based on first-hand experience.